Tash Moore here with the Pick of the Week as I can only provide. Which at this point means late and full of typos. That’s right. My pick ended up being Green Lantern #29 from the New 52. I had given up on this title when Geoff Johns left the book but it seems like I was wrong. The book took on a whole new direction that from what I’ve read so far, isn’t that bad. In this issue of Green Lantern, Hal Jordan goes to see his family ( his brother and his kids) and has some bad news to break. Since everything is going down with the whole galaxy out to get the Green Lantern Corp ( their rings drain the life force of the universe when used) and the Red Lanterns now led by Guy Gardner have taken over Hal’s old sector. I think it’s a really cool idea that for the first time the Green Lanterns no longer have a presence in that area. 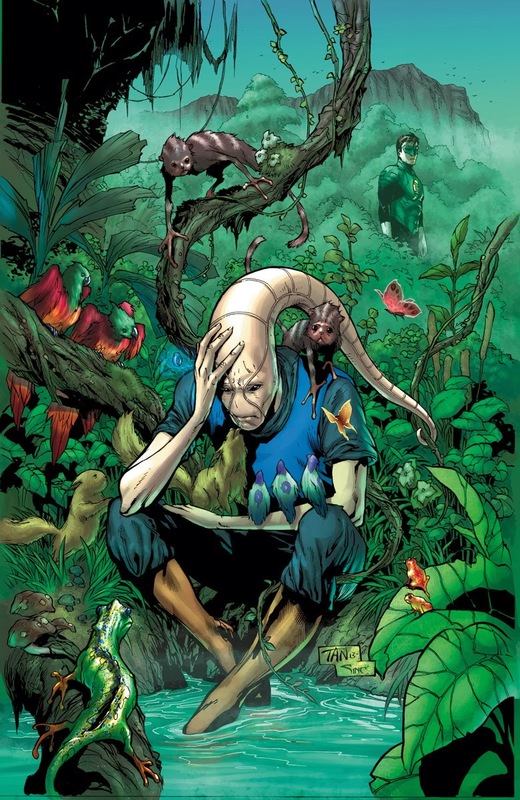 Saint Walker sits on Mogo boo-hooing about how he has no hope left. Saint Walker also talks about how he thinks he’ll never wear a Blue Lantern Ring ever again. Jesus, for a guy who’s every answer used to be about how all will be well, Saint Walker sure gave up pretty damn easy. Remind me never to invite this guy over to help set up anything from Ikea! The box is turned over and tons of small parts fall to the ground. Maybe I just wanted to make that joke. Maybe. Oh yeah, Hal and the Corps stop some group of thugs who are building a weapon to take down the GL corps. With the weapons blasted to bits Hal then takes them into custody and calls them “Enemy Combatants” so he can do whatever he wants to them and not have to give them rights. He also lets Kilowag waterboard them. Okay he doesn’t do any of that. He lets them off with a warning. But I like my version better. The whole thing ends with Hal trying to find the traitor who pretended to be him over Galactic TV, who’s hiding out on Mogo. I’ll admit that I do like the new direction of this comic. Without the Guardians to keep them in line it’s totally uncharted territory for the GLC. Plus having Hal as the top dog is pretty cool. He’s almost like a fish out of water seeing as how he’s use to taking orders instead of giving them. Good story and I’ll give thumbs up to the artwork in this issue. Normally Billy Tan isn’t that great and calling him an “Artist” is a long shot. But thanks to Martin Coccolo, Rob Hunter, and Walden Wong they pull it all together to make it look ten times better than anything we saw from him on New Avengers. Hats off to the DC editorial team! Dan Didio probably stood over poor Billy with a baseball bat, making sure the pages were up to snuff. That’s how this Pick of the Week will end.